The July meeting was held at Jack Putnam's with 14 members and guests in attendance. The meeting was led by Bob Torbet. We all introduced ourselves to the new members and ran through the past and upcoming events. Jack Putnam gave the treasurers report. The meeting ended with a demonstration on how to change the gear from an old transmission drum to a new transmission drum. 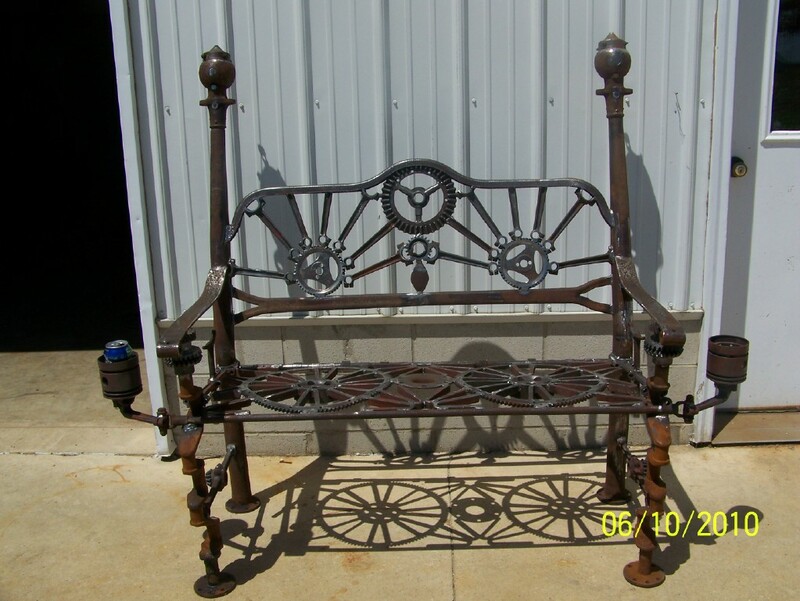 Since the MTFCI didn't give proper credit to the artist of this fine Model T bench, I thought that it would be proper that the Model T Ford Club of Northwest Ohio give Bill Lucius a big hurrah for this fine use of scrap Model T parts. 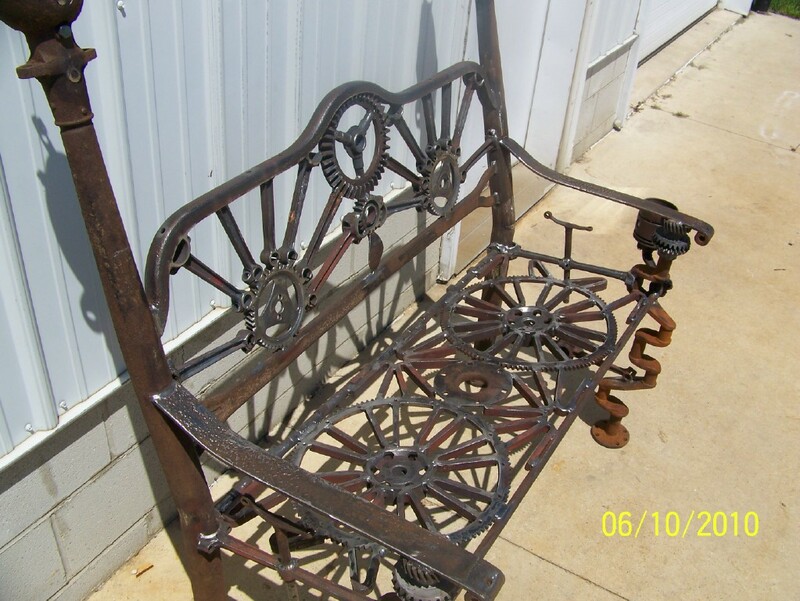 Many of the parts came from member Joe Bell's scrap pile. These pictures have been all over the internet and now an international publication. 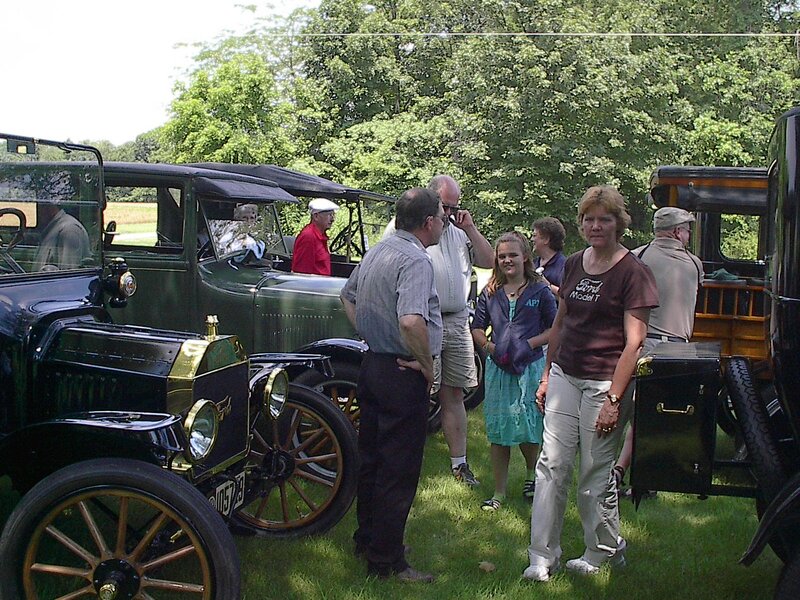 I toured with Bill this weekend and he still remains the same humble Model T owner and machinist that he has always been. Maybe we can have the bench brought to the meeting for closer inspection. The project presented at the July meeting was the change out of a gear from an original broken Ford drum to a new and improved transmission drum. The first thing that must happen is to remove the original gear from the drum. The rivets are then punched out to free up the gear. The Drum replacement is a newly machined drum from Dave Nolting. By providing a better material, the metal shold be able to transfer heat better than a traditional drum. Here we see Bob seating the gear into place in preparation for the new rivets. The new rivets are bucked on the anvil. Bob T is the brave soul that was willing to hold the drum in place while Jack swings the appropriate sized hammer. The project did not go entirely as planned; in that, the gear did not stay flush during one of the first swats on the anvil and the rivet opened up between the gear and the drum. So, the rivets had to be taken back out and the project started all over again, albeit in a lot quicker fashion. Dave Nolting and Brent Mize with the help of their wives and the Hardin County Chamber & Business Alliance created a nice little two day tour that took us from Mount Victory to Kenton on one day and continued on the next day to Ada. In Mount Victory we started with lunch, then spent a few hours visiting the local antique stores. There were also a few historical spots to see and of course some fine snack items. From here we toured through the afternoon via an Amish Bakery and an Amish Rug Maker. We ended Saturday with check-in at the hotel in Kenton and supper at Henry's. Sunday took us to a fine display of western art and lunch at Padrone's in Ada. 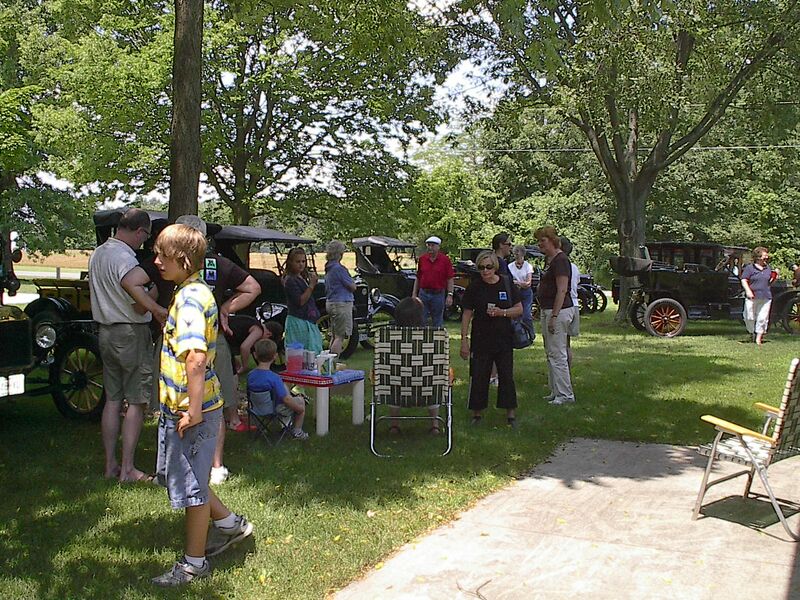 The day ended with refreshments at Jack Putnam's near Bluffton. In the little town of Mount Victory, we visited a restored old Gulf filling station. The owner had taken the building and brought it back to its original glory. From the original gravity flow pumps out front to the correct oil cans inside, one would think that they had gone back in time to the days of full service gas stations. 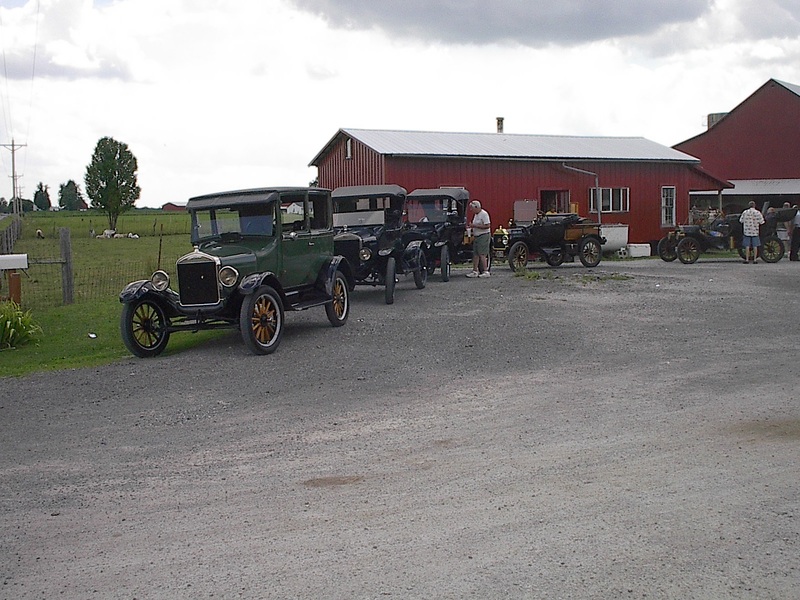 The Model T's parked out front were right at home in front of this filling station. Too bad there wasn't any fuel to be had. I'd love to get a picture of a Model T sometime getting fueled from an original gravity flow tank. There are likely laws that prohibit such a thing. Chivalry is not dead in the Model T world. Here we see Dave Nolting holding the door for Ken Stucky's wife, Betty. Dave is standing next to his 1926 Tudor. The Depot Hack in the foreground is owned by Kerry and Kim Buchenroth. 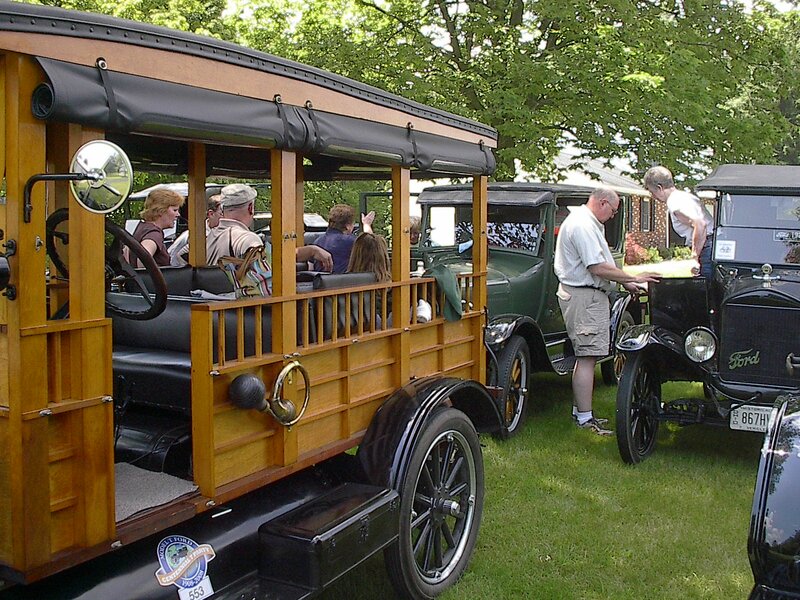 It is interesting that every time that Model T owners stop at a sight, they stand around and look at each other's cars like they'd never seen a Model T before. This is the Amish bakery that smelled so good and was so hot inside. Did you know that at one time people cooked in a wood stove that was not insulated from the room around it. This condition makes the room, where the cooking is done, very hot. The smell was so good that most of us tolerated the heat. The cookies coming out of the oven were scarfed up as fast as those Amish ladies could bag them up. The Northwest Ohio Club was well represented on this tour. Members included Ken & Betty Stucky, Dave & Cheri Nolting, Bob & Ann Torbet, Jack & Marilyn Putnam, Bruce & Barb Klepinger, Joe Bell, and Jim & Sue Cook. Many in this group are in multiple clubs; so, please excuse me if I missed someone. They also reprsent the Tickin' T's of Central Ohio and the Mad River T's. The fact is that I lose track of who is in which club. Notice the number of young people that you see in these pictures. It proves that the hobby is not dead the way some of the "nay sayers" claim. The last couple of pictures are taken at Jack's. Believe it or not, this group did finally go inside for some refreshments. For many, the longest part of the tour was started from this point (the long ride home).